Our standard fertilization & weed control program is 6 applications. These occur 4-6 weeks apart starting in the Spring. Although the majority of our customers use the 6 application program, you do have the option of 4 or 5 application programs. One of the many benefits of our lawn care programs is the backing of our Guarantee. Our guarantee to you…if the weeds don’t die or your lawn does not green up at any time within 30 days of an application, just contact us, and we will return at no additional cost. If you have a problem, simply give us a phone call or use the Service Call request on this website and we will be out within several days. It’s that easy! Another benefit of our lawn care programs is that we have the ability to handle difficult or hard to treat weeds such as ground ivy, violets, and nutsedge. 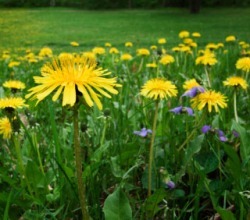 Many companies will not do what it takes to control some of these difficult weeds. In some cases, they will even charge you more money just to try. Our technicians have the products and ability to handle virtually any weed problem as they see them. In other words, if they see weeds, they spray them. Cost: The cost per application is based on the square footage of your lawn. To request an estimate, please call our office or Request an Estimate on this website. Your technician will be out within 2 days to measure your lawn and give you a free lawn analysis. If you are looking for a little help on your lawn and a scheduled lawn care program is not what you are looking for, we do offer any of our services on a one time basis. Please request an estimate and we will be out shortly to examine your lawn and help you make the right choice of our services. Please note that our “Clean & Green” guarantee and service call policy only apply to our 4-6 application lawn care programs.